Our traditional 1hour 30 minutes Wakeboard / Wakesurf lesson. Great for 2 to 4 riders. Our traditional 1 hour 30 minutes Wakeboard / Wakesurf lesson. Great for 2 to 4 riders. Ever imagine surfing an endless wave that is shaped just for you. With our Malibu M235 boat we can provide you just that! 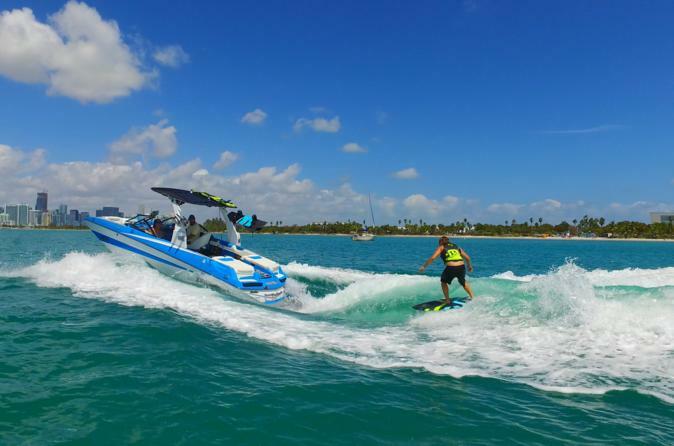 The technology of our boat has helped push wake surfing into the mainstream of the watersports industry. Our coaches can set up the wave for the youngest and newest members in the sport to the most highly skilled pros. South Florida beaches are beautiful but aren’t a surfer’s destination. With our boat, no surfer will go without when the swells at the beach are flat. We create the best wave right here in Biscayne Bay. Parents called it skurfing and their kids call it boarding, whatever you call it, with the proper coaching everyone will call it a ton of fun. Wakeboarding came out long after waterskiing but has really taken the watersports industry by storm. Where skiers needed ramps in the water to catch some air wakeboarders utilize the wake created from a boat to pop them up into the air. From just carving behind the boat to spins and flips wakeboarding will be fun for the whole family.